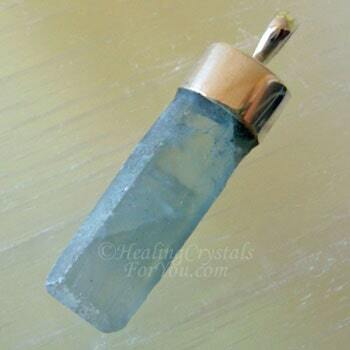 Blue Barite is said to be a magical stones as it stimulates coincidence and synchronicity, aids your memory and is known to have a good action to connect to beings in the higher realms. It is known to be particularly helpful to use for shock or trauma after an accident, and has been used for hundreds of years for this purpose. It was used in the past by women followers of the army as it was well known as a useful healing crystal to use for hands on healing. 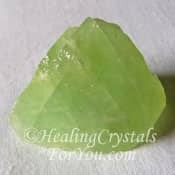 If you are working on developing psychic abilities, they are helpful healing crystals for you to utilize as they may boost psychic communication ability and intuition. 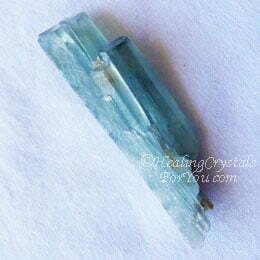 These blue crystals also have metaphysical properties that are advantageous to use in meditation. These stones are also admired as the color is so lovely. Jewelry made from these stones is both beautiful and has a number of excellent crystal properties. 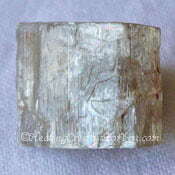 The meaning of the name Barite relates to an ancient Greek word "barus" which means heavy. The name of this stone can be a little confusing as it has gone through a few changes over time. 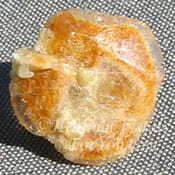 This spelling is the most common as it was the original spelling of this mineral. Later it was changed to the spelling Baryte, but both spellings of its name are now common. In addition, in some places you may also find it called Barytine. These stones commonly occur as quite lovely tabular or prismatic crystals which are sometimes twinned and may contain phantoms. They may also occur in the massive form as well as fibrous or bladed pieces. The make-up of this mineral is barium sulfate, and this family of minerals also includes celestine, anhydrite and anglesite. This means that both Celestite aka Celestine and Blue Anhydrite also called Angelite, are closely related to this stone and may have some metaphysical properties in common with it. Barite occurs in a number of colors including colorless, white, gray, yellow and brown as well as the blue colored crystals. 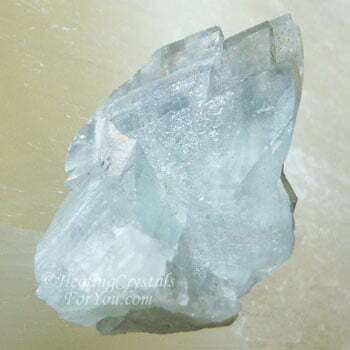 The blue crystals come in a few shades from deep blue through to a quite pale color. The blue stones are less common than the others and are not found in as many locations as the other colors. These blue crystals are found in a number of places in the USA and beautiful Blue Barite clusters are also found in Morocco. It is said that this stone was used in the distant past by the women followers of the army to treat men after battles. The women would place a piece of this stone on the third eye to calm the patient. This would place them in a highly relaxed even sublime state, until medical help arrived. The success of this use gave the stone a reputation as a quite magical stone. They also have an energy to release fear, and this may have also been noted at times when these people were at risk from those on the other side in battles. 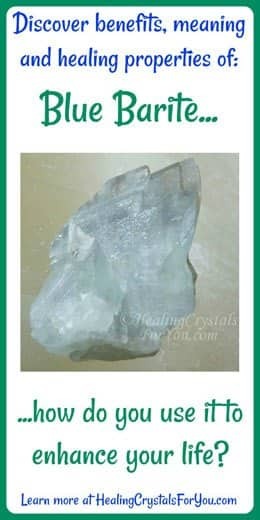 This is a lovely crystal to use for meditation and it is as simple as holding it in your hand when you sit down to meditate. It has an easy and quite effortless way of easing you into meditation. Using a piece on your third eye in meditation may be advantageous, as it makes a strong connection within the third eye and crown chakra and may aid memory. 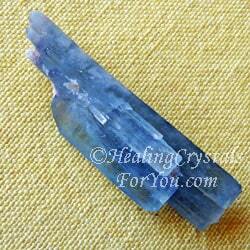 These blue crystals will help you to travel the higher realms with ease. They may assist you to make a better connection to teachers and guides in the higher realms including meeting your spirit guides. They have a good action within the throat chakra to help you to communicate better with other people, and may also heighten communication with beings in spirit. They may enhance your intuitive gifts, and their energy can assist you to make amazing journeys and meet beings from the higher realms, including connecting with angels who are waiting to guide you on your travels. Like other colors of Baryte, they have an energy that encourages coincidence and synchronicity, and keeping them on your body may assist these events to occur more often. This is one of the reasons why these stones were thought to have magical attributes. 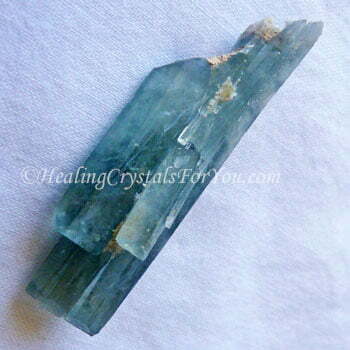 These blue crystals are known for their effect to aid communication and may help you to arrive at a goal with ease. Wearing them on your body as jewelry may be helpful as these crystals have a good action to both stimulate and cleanse the throat chakra. Blue Barite crystals are good to use under your pillow or to place nearby at night, as they may assist you to have dreams that can bring significant guidance to your life. Record these dreams, to see if there is any pattern emerging that will assist you in your next steps in life. The energy of these stones are useful to aid you to release fear that is related to situations where you feel a sense of an inability to move forward or to make new plans. 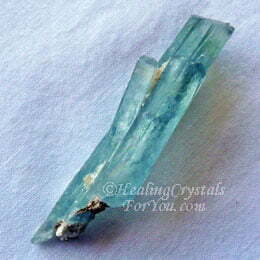 The healing properties of these blue crystals can be helpful to aid issues relating to the area of the brain. They are also known to synchronize the two hemispheres of the brain. This may aid anyone with problems related to this area, and they are known to improve the healing of other issues in the brain including degenerative conditions, and are said to assist those who have suffered from brain damage. They have a good healing energy within the throat chakra, and are known to be helpful to soothe those who have undergone chemotherapy or radiotherapy. These blue stones are said to help to lower blood pressure, and may help to ease fevers and bring relief from pain. "The world is so unpredictable. Things happen suddenly, unexpectedly. We want to feel that we are in control of our own existence. In some ways we are, in some ways we are not. We are ruled by the forces of chance and coincidence. " Paul Auster. 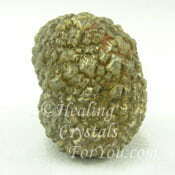 These stones have an excellent action within the higher chakras, which may aid healing of the brain and stimulate memory. If you are a student who feels it could be helpful to have a stronger memory, or if you have age related memory issues it may be beneficial to combine it with other stones that boost the memory. 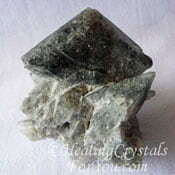 Crystals for memory that you could choose to use with this stone includes Diaspore, Thenardite, Green Calcite, Ascension Stone, Herderite or Hematite.